Although the hobby industry might be trending younger and more social, not all of the old guard is resistant. Back in Brooklyn stands Buzz-A-Rama, the city's slot car racing nirvana since it opened in 1965. Owner Frank "Buzz" Perri has seen the miniature racing scene rise, fall, and rise again three times over. He still sits at the front register every weekend, chatting with racers. "The racing scene has always been cyclical," he explains. "But lately I've been getting a lot of new people who find me on the Internet and want to give it a try." When Buzz-A-Rama opened more than half a century ago, there were nearly 50 other slotcar racetracks in the five boroughs. Today, Perri's store is the last one left. "The others all got into the business to make coin," Perri says. "For me, it's a real passion." Perri is glad to see the hobby industry trending social—after all, it's what he's has been preaching since day one, with his store having hosted countless tournaments and birthday parties over the past five decades. In particular, Perri and his regulars have noticed that online communities and forums have made it easier than ever for younger hobbyists to buy parts and get involved. 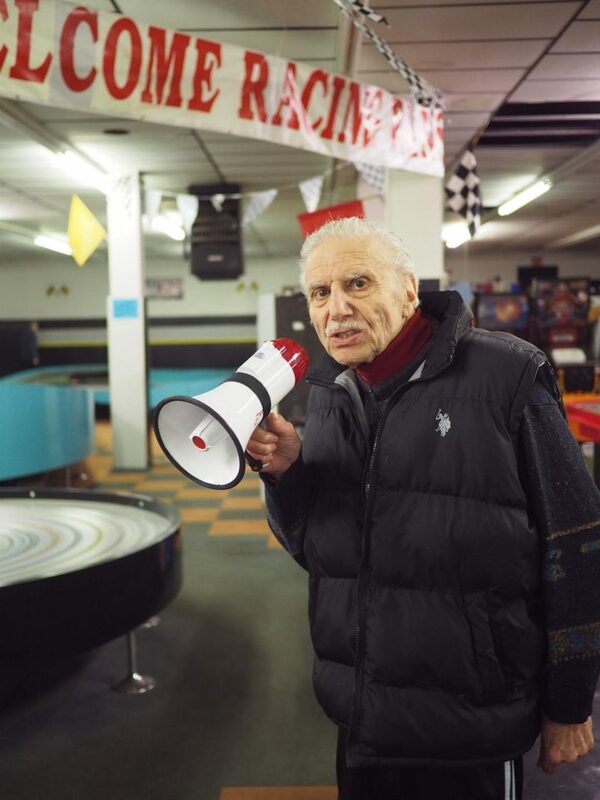 "Some of the younger guys take their cars really seriously," says Thomas Foster, a 68-year-old Brooklyn native who's been racing at Buzz-A-Rama every weekend for the past 15 years. "If I have a problem with my chassis, I'll fix it by eye, but the newer folks will strap their miniatures to a jig and whip out a micrometer. Serious stuff!" From the old timers at Buzz-A-Rama to the new enthusiasts at Rui Yong, the hobby industry has arguably never been this social. And that's music to the ears of enthusiastic drivers like Smolik. "Why are we all so passionate about this?" Smolik asks. "It comes down to this: My wife would not be happy if I parked a Lamborghini and a monster truck in my garage." He continues, "So this is how we live out those dreams. And as long as the companies keep producing these cars, people will keep finding ways to race them." The full article mashes up both 'Mini 4wd' and 'slot car' hobbies. Mini 4wd, which features the cars with the circular bumpers on all 4 corners, is uncontrolled as it goes around the track. The strategy is in the setup. Slot cars, on the other hand, are controlled by the pistol-grip devices that many of us played with as little kids, and (mostly) stay on the track due to a pin riding in a slot in the road surface. Read full story with more photos here: "Step inside NYC’s competitive slotcar racing scene" What New York's racing scene means for the resurgent hobby industry.